FREE. GRADES 6-12. REGISTRATION REQUIRED. Greetings, witches and wizards! Due to a mishap in your last Potions class, Professor Snape has sent you down to the dungeons for detention while the rest of your classmates get to enjoy a day at Hogsmeade. The portrait guarding the door might let you out – but only if you figure out the password! 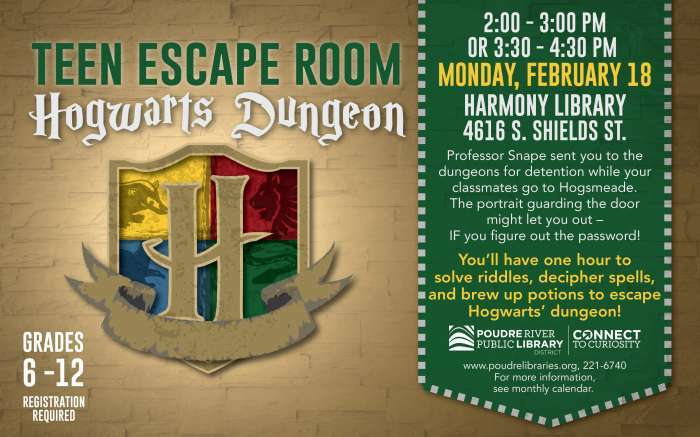 You’ll have one hour to put your skills to the test, solving riddles, deciphering spells, and brewing up potions to see if you’ll be the one to escape Hogwarts’ dungeon! For teens in grades 6-12, registration is required.